Make the leap and set up your design business with issue 289 – on sale now. Tired of working for someone else and dream of forging your own independent career? If so, you're not alone. Over a quarter of UK adults have ambitions of setting up their own business, and that number is on the rise. To learn how you can go about starting your dream business, the latest issue of Computer Arts sits down and talks with designers and creatives who have done exactly that. Perhaps, with their practical advice, 2019 will be the year you achieve your goal? 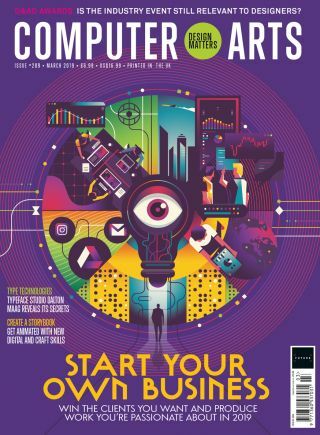 Packed with insights that cover the essentials every new business needs to survive, plus killer tips to make sure your portfolio attracts those all-important clients, this lead feature is here to guide you through choppy waters. And remember, if the commissions start to take off, it's okay to say no to work! Elsewhere in issue 289, we take a look at the latest lettering developments from Fontsmith in our showcase. As if there wasn't enough hot new talent to soak up there, we also take a look at the 15 graphic designer game changers who are poised to shake up the industry. Meanwhile, design agency Koto explains how to rebrand for an experimental age, and Dalton Maag reveals how it creates successful type design. Take a closer look at what's inside Computer Arts issue 289 by scrolling left to right through the gallery below. Computer Arts is the world's best-selling design magazine, bursting at the seams with insight, inspiration, interviews and all the best new design projects. For all this delivered direct to your door each month, subscribe to Computer Arts. Right now you can save up to 60 per cent, and receive a free Computer Arts tote bag when you subscribe.